Where do you go in the U.S. to view beautiful flowers? There are dozens of places, but the following are 7 of the top spots to admire gorgeous blooms. 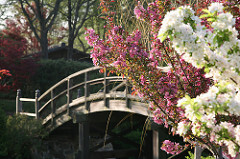 The Missouri Botanical Gardens in St. Louis offers 79 acres of flower displays, including a 14-acre Japanese garden and one of the world’s largest collections of endangered and rare orchids. At the Lewis Ginter Botanical Garden, visitors stroll through a classic domed conservatory that houses orchids as well as butterflies who flitter from flower to flower. It’s easy to visit the Franklin Park Conservatory and Botanical Gardens’ flower displays year round thanks to large greenhouses that keep blooms and guests covered from excess sun and rain. More than 400 species of plants live in these greenhouses. The desert is anything but lifeless, which you’ll quickly see when you stop by the Desert Botanical Garden in Phoenix. This space for viewing flowers focuses only on desert plants, on 145 acres complete with trails and shady resting stations. The ABQ BioPark Botanic Garden sits on the banks of the Rio Grande river, and it provides 35 acres of gardens for you to explore. You’ll be able to walk more than 1-1/2 miles of pathways as you look at Japanese flower exhibits and other glorious displays. Washington D.C.’s United States Botanic Garden is one of the oldest botanical gardens in the country. Congress established in it 1820, and today it’s still an amazing place to view outdoor gardens and flowers in spectacular conservatories. When you visit the San Francisco Botanical Garden, you have nearly 100 magnolia trees blooming around you (from January to March) and many other exquisite blossoms filling the space of what’s one of the most stunning gardens in the nation.